6 Commercial Real Estate & Properties in Beaudesert are listed in 3 categories. We have 4 Development LandsSale , 1 Retail ShopsSale and 1 Industrial Warehouses Sale . bull; Land area: 51.96 hectares bull; Balance residential land within Oakland Estate, Stage 1 complete bull; School, service station and shopping centre (under construction) directly adjacent bull; Significant Queensland State Government and private projects are anticipated to drive strong population growth in this region including $30million Bromelton SCT Terminal which opened in January 2017 bull; Essential infrastructure constructed and delivered to site bull; Less than one hour to Brisbane and Gold Coast Mark Creevey 0408 992 222 Tony Williams 0411 822 544 approximately This property is being sold without a price therefore a price guide cannot be provided. The website may have filtered the property into a price bracket for website functionality purposes. Approved Affordable 90 townhouses ready to go in the booming South of Brisbane. $90k Consultant Fee for BA has been paid, ready to be lodged. The construction of Australia's largest Inland Port nearly started in May 2016, potentially employing over 30,000 people. The new McAuley College across the road is also under construction. 1km to town centre where Scenic Rim City Council, Schools, Golf Course, Woolworths and Coles Supermarkets are located. All the hard work has been done, save time and money to start your project now. 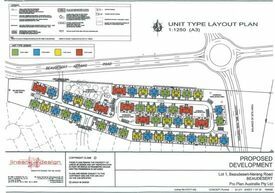 Call today before it is gone forever. .
Da Approved 90 Townhouse Development Site! * $3,600,000 + GST @ $44,00.. The property for sale is situated in Beaudesert, approximately 64 kilometers from the Brisbane CBD and 70 kilometers from the Gold Coast CBD. The 20.74 hectare land is situated on the southern side of the Brayford Park Estate, which is approximately 2 kilometres east of the centre of town. The land was previously approved for residential subdivision and older person accommodation. We are marketing the land undeveloped and without approvals. Preliminary investigations indicated that the site would yield a minimum of 200 lots, based on average lot areas of 700m2 (this assumes that council prefers park contribution rather than land content). The property is being sold with considerable council credits, please contact for more information.